The archaeological site of Rudičevo lies east of the village Torčec in the Koprivnica-Križevci County. On the east, the site is surrounded by the dried out bed of the Gliboki brook, which would fill with water during the wet periods of the year. The elevated terrain ends in the west with a strip on which surface scatters of pottery were observed. The Rudičevo site was visited on several occasions during the 1990s, when numerous potsherds were collected. Following an analysis of these finds, a systematic field survey was carried out in 2002. On that occasion, two irregular spots of black earth were observed on the north-eastern slope of a prominent hill, with surface finds of daub and fired earth, fragments of burnt stone and several mediaeval potsherds. In 2006, a test archaeological excavation was carried out in two trenches that covered an area of 378 m2. On that occasion, a number of mediaeval archaeological contexts were investigated, all of them positioned on the top of the elevation. A single-room semi-sunken residential structure of a square plan was identified, with a hearth in the western part of the house dated back to the second half of the 13th century and the beginning of the 14th century. Besides this residential structure, a narrow ditch dated to the same time was found nearby, which probably formed part of the structure and the planned organization of the settlement, that is, it probably represents the remains of the parcelation of the household, in which, it should be emphasized, the line of the row follows the line of one of the sides of the structure. 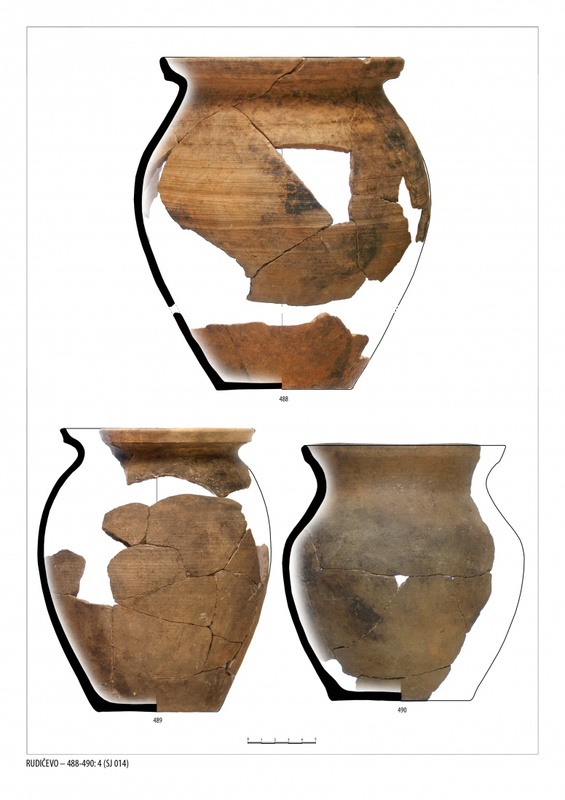 The assemblage of movable finds from this site includes fragments of wheel-made ceramic vessels, with various forms of pot rims, scantily decorated with wavelines and horizontal lines, although white painting on a red background is present, too. Households feature, in addition to ordinary cooking pots, diverse vessels, for instance jugs, cups and plates. An interesting feature is the presence of discoid ceramic objects and an abundance of small iron objects used in households during the 13th and 14th centuries.